Dinesh Upadhyaya is a man of many talents, and a lot of these talents have also earned him world records. According to his Twitter bio, the school teacher from Mumbai holds over 89 Guinness World Records (along with 57 Limca records and 3 Ripley's world records). His latest feat to have earned him a Guinness World Record? Holding 22 lit candles in his mouth! 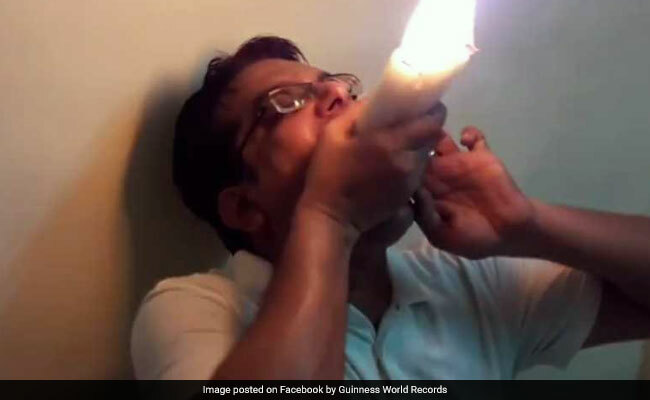 A video of Mr Upadhyaya, shared by the official Facebook page of Guinness World Records, shows him attempting this impressive feat. Since being shared online just 18 hours ago, the video has been viewed over 3.7 lakh times on Facebook. Other records that Mr Upadhyaya has earned include most number of grapes eaten in one minute (73) and most billiard balls held in one hand (10).